Progress on the Bickles Foods building for Susquehannock Industrial Park has been moving at a snail’s pace. (Actually, The whole Susquehannock project has been slow.) I’m happy to announce that I’ve reached a milestone: the roof is done. Whew. There’s something like 180 pieces of styrene that went into the finished roof, counting the various panels, fascias, braces, and details. Most of that count is the individual seams, which are not part of the sheets, but come in the package as separate strips. Each seam needed to be glued into its groove in the roof, then trimmed to size. All this for a roof I want you to ignore when you see it. Why all this trouble? I desperately want to avoid I-Recognize-That-Kit Syndrome, the bane of model railroaders everywhere. I-Recognize-That-Kit Syndrome breaks the illusion that you’re looking at a tiny version of the real world. It reminds you that this is all just models. Not that recognition is bad. If I build a building, and you look at it and say, “that looks like the Lackawanna’s yard tower in East Binghamton,” that’s fine. I’ve evoked a scene on a real railroad. That’s my goal. If, however, I build a building, and you look at it and say, “that looks like Model Power’s Erie Station kit,” I’ve failed. I’ve left your head stuck in the model world. 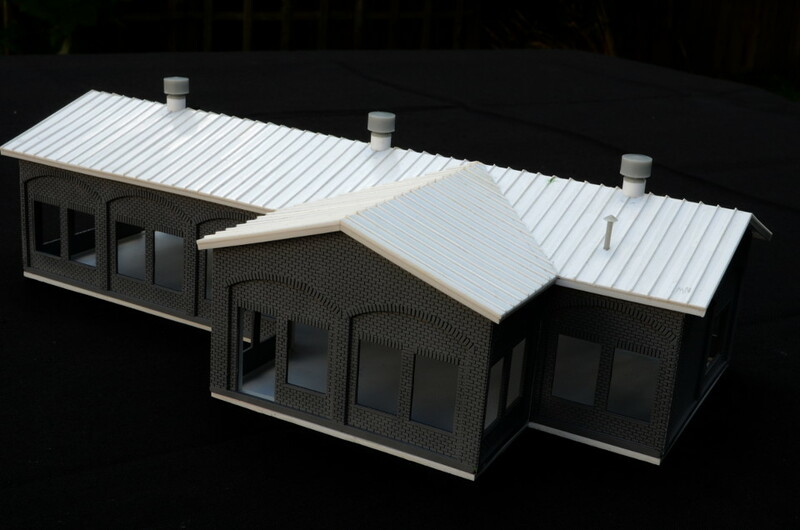 To that end, the Superior Bakery kit’s roof, with its skylights and cupola, is distinctive, and not at all evocative of any real building I know, so it had to go. The new roof is Evergreen standing-seam metal roofing sheet, with Evergreen strip styrene around the fascias. I designed it with a little overhang, to further contrast with the original roof, which was flush to the walls. 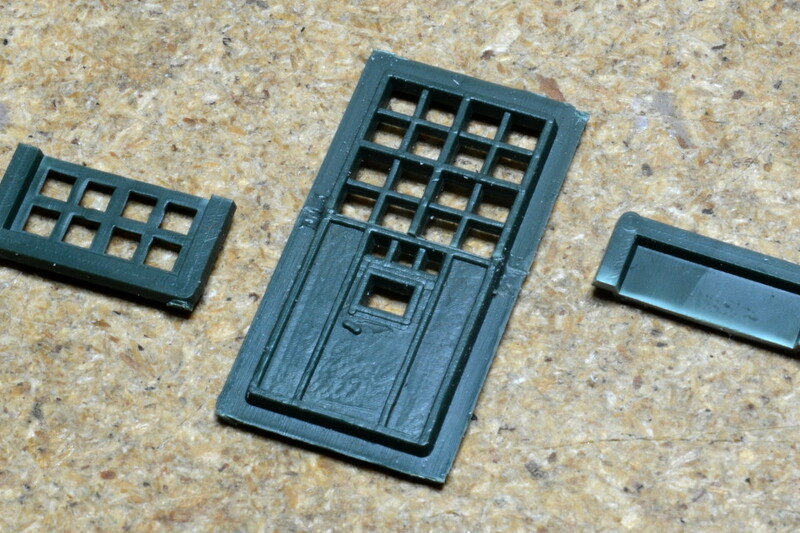 The vents are from Walthers’s modular roof details set. The smokestack base, with its lovely row of rivets around the edge, was carefully cut out of the original kit roof. With the roof finally under control, I also spent a little time on the front entrance. The cutout for the door had a blank piece of wall above it, which I removed. I chopped the top edge off the door insert, and added part of a window above it to fill the space. (My NWSL Chopper made this surprisingly easy to do.) I also used some strip styrene behind the wall to recess the door just a little. Study old industrial buildings, and you’ll notice that the front entrance—the one used by visitors—was the only one the architect put any effort into. Entrances used by workers received no embellishment. It’s all downhill from here. I’ve started the painting; once that’s done, there’s just the final assembly left to do.